A cursory glimpse into any of today’s social media networks such as Facebook or Twitter where Nigerians discuss topical national issues might leave one with the impression that frustrated Nigerians are ready to tear each other apart, with the cyber salvos and hateful comments some throw at each other. Even some erstwhile respectable public personalities haven’t been left out. One in particular, in a recent write up, referred to Nigeria as a contrived “forced marriage between the poor husband (the North) and the rich wife (the South)”, effectively confirming his descent into this murky cesspool of mudslinging. 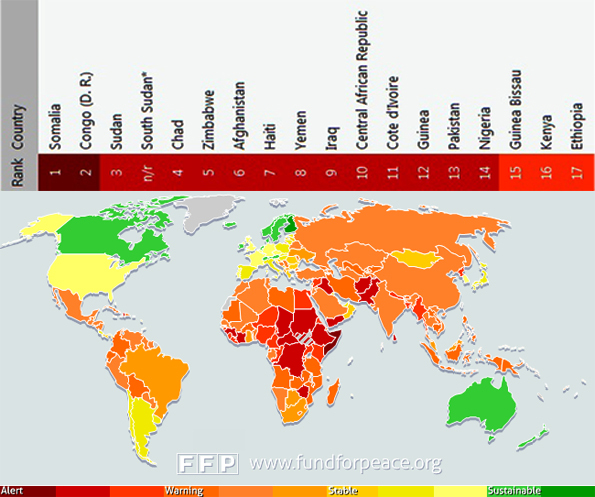 In this ripe atmosphere thus, the Fund For Peace’s (FFP) recently released annual Failed States Index (FSI) in which Nigeria is ranked the 14th most failed state in the world couldn’t have come at a more critical time, when Nigeria is grappling with numerous socio-political, economic and security challenges threatening its core foundation. The Index raises a number of issues regarding Nigeria’s impending failure and one wonders whether the Index has sufficiently and accurately captured the peculiar nation-building challenges bedevilling such a country. The Failed States Index (FSI) is an annual ranking of 177 countries compiled by the Fund For Peace and published by the American Foreign Policy magazine, which places countries on a continuum of most failed and least failing states. Nigeria’s 2012 ranking at number 14 is the same as that of 2011, though its status has been upgraded from an amber “Warning” last year, to a red “Critical” this year, only one step away from the deep crimson “Alert”, the exclusive domain of truly collapsed states like Somalia and the Democratic Republic of Congo (DRC). The methodology of this ranking is based on 12 indicators placed within three categories namely: social indicators, economic indicators and political and military indicators. Of the 12 indicators however, none seems to have sufficiently captured citizens’ (of these countries) perceptions of their relationship with the state, with each other and other elements of national identity, a key factor in state failure. In Nigeria, especially in recent times, it is not uncommon to find heated and emotional discussions over Nigeria’s viability and whether it would ever consolidate its nationhood, where inhabitants identify with it and feel a sense of brotherhood towards one another. Suddenly many are mulling over the possibility of Nigeria disintegrating, an unthinkable prospect just 5 years ago — from the confused columnist cashing in on the opportunity to spew their bigotry to the frustrated youth sounding off in cyberspace; the manipulative politician capitalizing on such frustrations to claw out from the fringes of obscurity, to teenagers donned in their sagging trousers and earpiece(s) reciting the late Obafemi Awolowo’s catchy aphorism that “Nigeria is a mere geographical expression” with such precision that you’d think he personally uttered these words to them. Many Nigerians are increasingly questioning the very foundation on which Nigeria exists, whether a “Nigerianess” which binds people across ethno-religious divides within a single nation really exists beyond the pages of Social Studies and History text books. The FSI and its 12 indicators rightly point out the challenges bedevilling the Nigerian state – such as uneven economic development or dearth of public services – which could accelerate to an impending failure, but the Index doesn’t succinctly capture this nationhood quagmire. An important element of nationhood and nation-building, especially for a complex and diverse country such as Nigeria is the existence of unifying national values and symbols that bring together diverse people under a single umbrella of a national identity, giving these different people a good reason to substitute broad-based national identities for primordial loyalties and identities. These shared values are mostly represented by symbols such as a national flag and anthem, a glorious history such as the British monarchy’s imperial history — arguably a uniting force in an increasingly multicultural Britain — or shared aspirations, such as the USA’s “American dream”, espousing ideals of freedom and equal opportunity for success through hard-work for anyone in America, their social class or circumstance of birth notwithstanding. In Nigeria, national values, aspirations and their accompanying symbols are progressively losing their meaning such that with the exception of routine recitals by starry-eyed primary school pupils at early morning school assemblies, the national anthem and pledge mean little to many others. Many a political appointee has been thoroughly embarrassed at a National Assembly screening for their inability to recite the national anthem. Nigerians are increasingly becoming disdainful of and detached from the state and from each other, keen to emphasize on the differences between one’s church and their neighbour’s mosque and vice versa, rather than the poverty or unemployment that afflict them both. This gradual erosion of national identity in Nigeria, as crucially important as it is, is something the FFP’s Index doesn’t quite capture. This nationhood challenge becomes more crucial when one considers that perhaps a key factor in state failure is when the citizens gradually stop identifying with that state and what it stands for and they increasingly emphasize on how very different they are from one another, as manifestation of a retreat to primordial loyalties of tribe, ethnicity, religion and region rather than a broader national identity. Essentially, people’s bond over broader national values weakens as they feel they have little stake in a state espousing these values, that barely provides infrastructure or guarantees the security of lives and property. As this happens over time, then inevitably insurgent groups with various grievances like Boko Haram, separatist militant groups and other centrifugal forces are birthed, which, if not checked and mitigated could gradually tear the country apart. At this critical juncture in Nigeria’s history, a key building block of nationhood could entail redefining our national values and reviving or getting a new set of unifying national symbols to fit current realities. 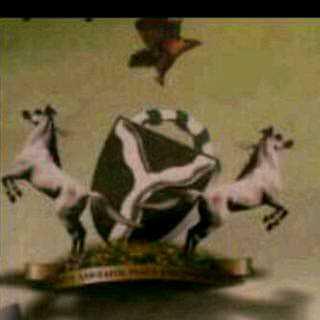 In some respects, perhaps this is what Dora Akunyili’s “Rebrand Nigeria” campaign tried to achieve in futility. Thus, rather than focusing on how a Hausa man differs from an Igbo man, the Tiv from the Jukun or the Ijaw from the Yoruba, Nigerians could focus on things that bind us together – that PHCN doesn’t discriminate when it abruptly takes away the barely available electricity just as you’re about to iron that favourite shirt for an appointment or for a date; that when traversing the Kaduna-Abuja, Lagos-Benin or other treacherous death traps we call roads in Nigeria, a silent yet fervent prayer to one’s Deity constantly hangs on one’s lips; that Rice and Stew, a staple in most households across the country is probably the closest we’ll have to a national dish; that regardless of our ethnicity and religion we love our flamboyant and colourful parties, bikis and owambes; that in the midst of other Africans our confidence and brilliance always shines through; that pervasive corruption has ensured that almost every ethnic group has had its “turn” in slicing off hefty chunks of the national cake at the expense of others; and that ultimately, we all desire transformational leadership which will deliver the most basic and intrinsic of public goods — electricity, potable water, security, decent healthcare and education. Finally, given Nigerians’ remarkable ability to endure despite the most profound difficulties, perhaps the reason why Nigeria has persisted despite its poor showing in most of the FSI’s 12 indicators is because Nigerians still have a reason, relatively, to identify with the Nigerian state — despite all its shortcomings — and the moment this ceases significantly, then the endurance would end and the chaos would begin. Ultimately, it is Nigerians’ identification with the Nigerian state and with each other, the ability to congregate around a collective national identity and ignore the divisive antics of some desperate politicians willing to capitalize on the frustration of Nigerians that might end up actually saving Nigeria from itself. Informative indeed. Thank you Z.
Oh! This is vividly, academically, & excellently summerised piece!!! Not exactly a new piece of information to be honest.Nigeria is a concoction of traditions/tribes that should never have been bundled together in the first place, and whatever fabric (try military dictatorship) held the nation together is no longer there…so I am afraid there is no real “collective national identity” to congregate around, there never was. In as much as we would like to deceive ourselves that we share something in common (beyond the superficial) with each other, we really don’t,never had and probably never will. The only way we can do justice to the nation and everyone in it, is to first of all admit that the colonial experiment called Nigeria was always destined to fail, rather be stuck in this wishful thinking that we could change the mindset of a people in one generation or two generations…once we get out of this virtual utopia, then we can start thinking about the most peaceful way of dissolving this union, whatever the consequences. Of course the other less ominous way of trying to salvage this car wreck of country, is to “hope” that within our life time we will have a radical set thinkers from all the religious and cultural divides, that will look beyond the ethno-religious superficiality and work towards building a nation state, but it is only a “hope” which we have been at for a long time, so don’t expect anything in our life time. I don’t think I agree with your comment about the split up. Many have been saying this but have you ever thought of the impracticality. How do you split Nigeria for instance? Is it along tribal lines? That definitely will create nothing less than 20countries because I can assure you that once you start the fragmentation, it leads to further multiple fragmentations. Will you do that along religious lines? Then you’ll have to explain how the division will go ’cause so many states are so religiously intertwined. And at the end of the day, even if you achieve the impossible breakup will you be better-off than south Sudan? The better option is to stay together and fight the forces driving us towards poverty and lack of unity. Period. Any other thought is simply a dream. Sheriff, Nigeria will never be a nation state in as much as we all want it to be. The “forces driving us apart” are unfortunately us (collectively), blame it on history,culture,religion or whatever, simple fact is that we cannot exist as a country (never mind nation) in our present form; one way or the other something has got to give and very soon the level of intolerance we seem to forever have for one another will soon reach critical mass and it will implode onto itself. The breakup solution is not about being “better off”(whatever that means), it is about saying the status quo cannot and should not continue – yes, there is no denying the fact that there will be absolute chaos in the aftermath, but that chaos will be as a result of people fighting for self determination within a confined region (whatever the final borders will look like), and besides our division is not solely about religion, it is about “culture”. the Hausa /Fulani have a more or less similar culture and the Yorubas (Muslims and Christians) have similar culture but different religion and they will be just fine (when was the last time you heard a Yoruba Christian attacking a Yoruba Muslim and vice versa? )- Yes we may be intertwined in the “community” sense of view, but we have never intertwined culturally, you just need to move around any “cosmopolitan” city in Nigeria to see what I mean…you will find that even within a given community, there are cultural clusters and not necessarily religious clusters. Sadly I am a pessimist and I am not sure if it is worth it for people to keep dying. I know it will be very hard to restructure the country due to the large number of ethnic groups and the the lines of religion, but can we realistically say that we will overcome the current problems. The trend now is that the divisions are getting wider and deep down most ethnic groups view the other with suspicion and to say otherwise will be running away from the obvious. Thanks Zainab for the work you do. The road is long but please remain steadfast. One day, we’ld wake up from our slumber and do the right thing as a people, Insha Allah. While i wouldn’t call to question the findings of the ranking report, its focus is on the physical ‘evident’ realities the researchers could monitor in the course of their study! There are still some invisible strands of relationships and mutual love that exists across Nigeria. There are evident cracks, but i have a feeling that there is a salient thread of love for the fatherland that runs across the hearts of Nigerians! Whatever our individual and collective anger against the Nigerian ruling class or between ourselves, maybe it’d be the realization of the hard reality that we are all victims that will save Nigeria! Great article with a subtle approach which I hope will still hit most readers with the critical points. I am a nation-building evangelist fully committed to evangelising this message to all Nigerians and in the process raise an army of citizens who will put Nigeria first in their thoughts, words and actions. The blog with nation-building articles is bobbyudoh.com and on there, you will find the link to the book I wrote on this topic titled ‘Nation-building: How to build and sustain a developed Nigeria’. I aim to put this book in the hands of most Nigerian youths in order for the mind-set to be transformed and the national values you mentioned is brought into our way of life. Mouky, you are absolutely right. Do we really need each other? and my answer in NO. From the onset; our late GREAT LEADER of Northern Nigeria (Sir Ahmadu Bello) had said that Nigeria is a mistake of 1914, similarly the Yoruba messiah (Obafemi Awolowo) who had never hidden his hatred against Hausa Fulani had on so many occasions stated that Nigeria is just a mere georaphical expression, while Zik the Ibo liberator who masterminded the 1966 coup with genocide twist in order to annihilate the Northerners (most especially Hausa Fulani) wanted to break up the country. So you can see that even the leaders then were skeptical about existance of Nigeria as a nation. We have collectively wasted 50 years, therefore, the earlier we rationally recognise that and compel the leeches (our present leaders) forcing us to maintian the status quo to free us form the unworkable pact the better. After which, every ‘region’, ‘geopolitical zone’, state, local government, tribe should be ready to bear the economic, physical and psychological consequencies!!! Ladies and Gentlemen, there is no homogeneous country on the globe. The Unied States of America is the one of the most diverse and complex nation in the world, a nation built by immigrants from all over the world. Yet it is progressive and developed and peaceful. Our being a nation of many ethnic and religious groups is not a reason for our backwardness and lack of peace. We must identify our source of unity and build on it. The USA found one- liberty, freedom and social justice. What makes Christianity different from Islam? What makes a Yoruba man different fron a Hausa man? We all have humanity in our heart. That should be our source of unity. We were from the same root. Nations and people exist on the spirit of consensus and agreement. We can’t be different. As long as people like Zainab exist, there is hope for Nigeria. She made a number of points in this article, particularly the miserable conditions which all Nigerians experience or basic amenities for Igbos, Yorubas, Hausas, Tivs, Muslims and Christians alike). I would have appreciated some insight on the motives and connections of the American Foreign Policy magazine, ie the publishers of the report/index – all the more so when we remember the predictions of another American organisation (the CIA), that Nigeria will disintegrate into mini-states by 2015 at the latest. Nonetheless, this is excellent and commendable work from Zainab Usman. Very commendable. She made a number of points in this article particularly the miserable conditions which all Nigerians experience, and in which all Nigerians are united (ie, the lack of social services or basic amenities for Igbos, Yorubas, Hausas, Tivs, Muslims and Christians alike). I defntly feel more Nigerian after reading this; esp the part listing our shared experience (in place of a national value); of course ignoring some comments. This unification may be more encompassing than if it is based along economic class (which is the other u mentioned). You are just a tiny proportion of a tiny elite that is largely psychologically removed from the realities of the lower ends of society. The simple thing is that we just don’t know. However, my interactions lead me to believe that the idea of a shared Nigerian destiny is either dead or dying. Suppose after reading elegant prose like this, patriotic fires burn in your heart – what are you going to do? In most part, nothing. The daily bump and grind of existence continues and people will still cling to the artifacts that make sense to them in a rapidly changing World, i.e. Church, Mosque, Tribe and Family – not nation and not Nigeria. This is the soundest piece of reasoning on this site. The truth is nothing will change! The educated elite are too busy mopping, stackin up Forex with which to flee. The rich and powered elite are slowly loosing control of the in-fighting. The idea of Nigeria is NOT a rallying point for anybody. Observation: Of the 17 countries in the FSI above, 13 are African, 14 are black (including Haiti) and all are non-white, so-called Third World nations. There must be a good reason for that. AND it is very strange that Libya, a country which was deliberately destroyed and fractured by the West isnt on the index published by this American organisation. Very strange. Or deceitful. These people must think we are idiots, that we dont know whats going on in the world. Is it not a matter of public record that in Somalia, the archetype and grand-daddy of failed states, Muslim scholars and clerics made a concerted effort to rebuild Somalian society in the last decade? What happened? The US sent it’s Ethiopian proxy into Somalia to wreck their efforts, thats what happened. It is also a matter of historical record that in the 1990’s and right up to the present time, the West has choreographed a programme of destabilisation and recurring invasions in the DR of Congo through it’s Ugandan and Rwandan proxies (ie, weakening the Congolese government in order to enable the continued exploitation of Congolese resources). In Cote D’Ivoire, was it not the case that France and the West intervened, militarily, to remove a sitting head of state? But these are the same people telling you and me about failed states … but they never mention the I word (imperialism) or the mastermind role which imperialist interests play in the creation of failed states. In Haiti, the US kidnapped a sitting president (Aristides) and dumped him in South Africa for a number of years. He’s only just gone back home. And I’m talking about the second time, not the first time he was deposed by the US in the early 1990’s. Actually, I highly recommend a study of Haitian history. And the history of every country in this index. I simply love the write up. The problem with Nigeria and Nigerian State is self denial. I have the opportunity to have lived and served in every part of Nigeria and discovered that we are the same people differed by language and culture. The factors that unite us are far more than the factors that divide us. If we can open up and stand by the truth of our unity we will surely be great again. We are all born free. The civil war would have thought us a great lesson but due to the fear factor and sentiments we failed to learn from it. Those I call brothers today are not from my ethnic group but for the fact that we can lay down our lives for each other we remain one. I will not subscribe to the fact that we are a failed or failing state. That we are going through difficult time does not make us a failing state. Those that are fanning the embers of division are doing so cos of greed and selfishness. Nigeria has been good to all. Corruption has no language, tribe or religion. The evil affects us all and we will tackle it together. Thanx Zee. Keep it up.